Oscar Wilde (1854-1900) was an Irish playwright, novelist, poet, short story writer and Freemason. Known for his barbed and clever wit, he was one of the most successful playwrights of late Victorian London, and one of the greatest celebrities of his day. A poetic narrative describing Oscar Wilde's experiences in the Reading Gaol. FCIT. "Oscar Wilde author page." Lit2Go ETC. Web. 22 April 2019. <https://etc.usf.edu/lit2go/authors/138/oscar-wilde/>. 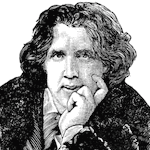 FCIT, "Oscar Wilde author page." Accessed April 22, 2019. https://etc.usf.edu/lit2go/authors/138/oscar-wilde/.